You are here: Home / Red Yarn Blog / Events / Show this Saturday, Nov. 12, at Northwest Library! Show this Saturday, Nov. 12, at Northwest Library! 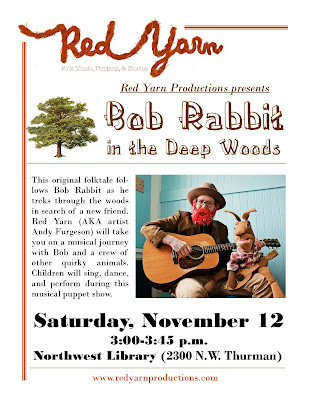 Join Red Yarn this Saturday, November 12, for his first show through Multnomah County Library! Red is performing the new and improved one-man show “Bob Rabbit in the Deep Woods.” As Bob hunts for a new best friend, he encounters a possum, a frog, a snake, and a whole lot of great American folk songs. With engaging puppetry, interactive songs, and lively storytelling, this show will be fun for the whole family! Saturday, November 12, 3:00-3:45 p.m.
http://redyarnproductions.com/wp-content/uploads/2016/04/bright-red-logo-for-web1.jpg 0 0 Red Yarn http://redyarnproductions.com/wp-content/uploads/2016/04/bright-red-logo-for-web1.jpg Red Yarn2011-11-10 09:48:002011-11-10 09:48:00Show this Saturday, Nov. 12, at Northwest Library! November shows! Red Yarn at Capitol Hill Library, January 7!